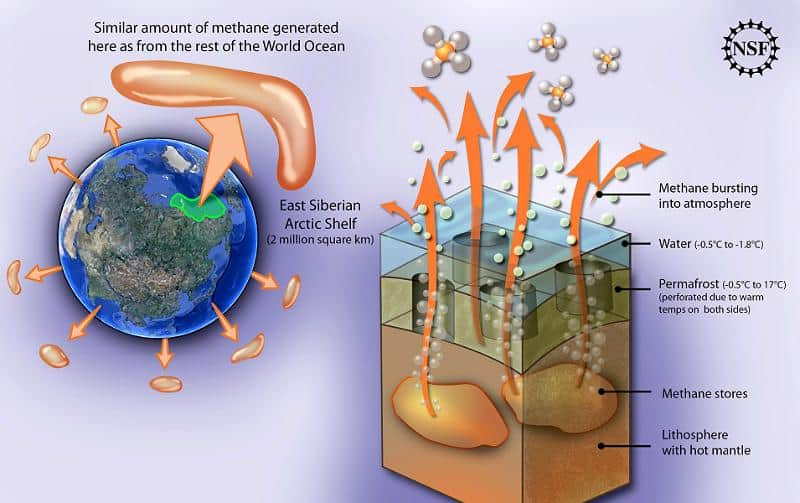 Arctic methane gas release is one of the most powerful environmental forces to impact global warming on an unprecedented scale. 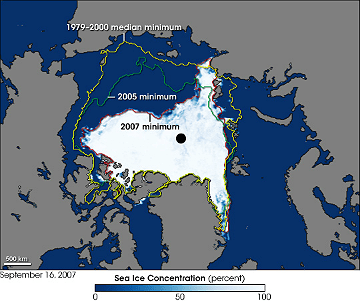 NASA image created by Jesse Allen, using AMSR-E data courtesy of the National Snow and Ice Data (NSIDC), and sea ice extent contours courtesy of Terry Haran and Matt Savoie, NSIDC, based on Special Sensor Microwave Imager (SSM/I) dataSince 2008, scientists at the University of Alaska Fairbanks have amassed ample evidence which shows that methane has been leaking from beneath the underwater permafrost in the East Siberian Arctic Shelf for years. 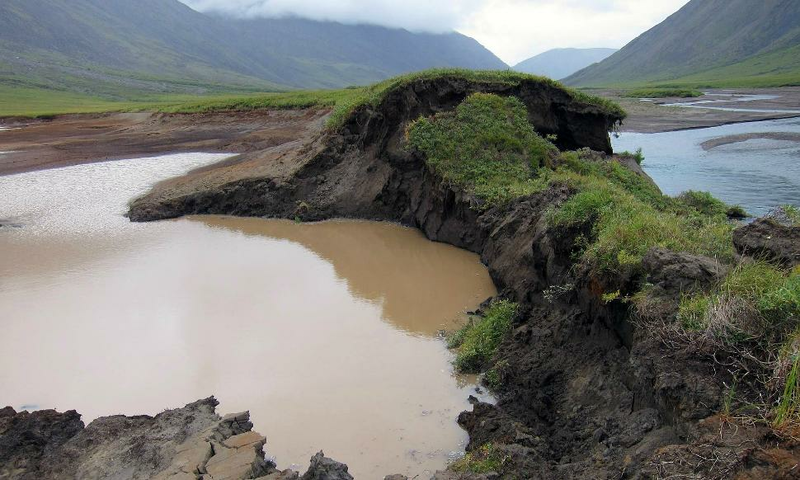 Permafrost was once thought to be the protective "lid" which kept methane from affecting our environment. Methane is worse than carbon dioxide - it is roughly 30 times more potent as a heat-trapping greenhouse gas. In a 2014 report, Cristian Gudasz et al. analyzed almost 1,600 temperature measurements and methane emissions from 127 freshwater ecosystems around the world. The scary conclusion is that "methane emissions will outpace that of carbon dioxide from these sources." For example, freshwater methane thrives on high temperatures. 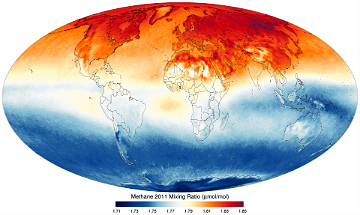 Emissions of methane at 0 degrees C (32 F) would rise 57 times higher when the temperature reached 30 degrees C (86 F). "I believe that all other arctic shelf areas are significantly underestimated and should be paid very careful attention to. We believe that the release of methane from the Arctic, and in particular this part of the Arctic, could impact the entire globe." 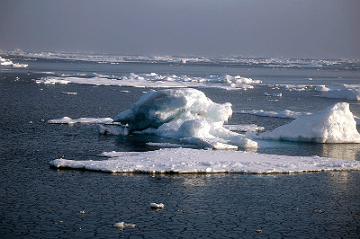 The East Siberian Arctic Shelf is over 2 million square kilometers of Arctic Ocean seafloor. 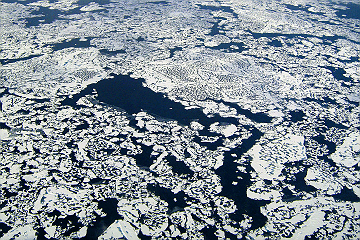 It's a methane-rich region which is over 3 times as large as the Siberian wetlands. The Siberian wetlands used to be regarded as the main source of atmospheric methane in the Northern hemisphere. "We have to control methane immediately, and natural gas is the largest methane pollution source in the United States. If we hit a climate-system tipping point because of methane, our carbon dioxide problem is immaterial. 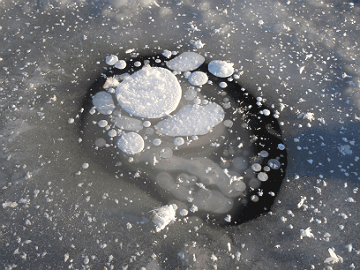 We have to get a handle on methane, or increasingly risk global catastrophe." The take home point I'm getting about methane (from any source) is that it is the key greenhouse gas we need to control right now - in order to buy some time to get a handle on our emerging carbon crisis. NASA's Earth Observatory on flickr / Licensed under Creative Commons Attribution 2.0 GenericIn the cover story of Chemical & Engineering News Methane’s Role In Climate Change by Jeff Johnson, I learned that methane comprises only about 9% of greenhouse gases, yet it has 86 times the global warming potential of carbon dioxide in the first 20 years after it's released into the environment. However when methane is burned for electricity, it emits about 50% of the carbon dioxide that coal does. This explains why natural gas has been heralded as part of a climate action plan to cut carbon dioxide emissions. Giorgiogp2 (Wikipedia) / Licensed under Creative Commons Attribution-ShareAlike 3.0 UnportedThe problem lies in the leakage of methane into the atmosphere. Howarth believes that methane emissions from natural gas fracking and drilling is well above the EPA’s calculations of between 1 and 2%. Perhaps up to 7.9% of it escapes during venting and from leaks over the lifetime of a well. Another study seems to confirm Howarth's findings. 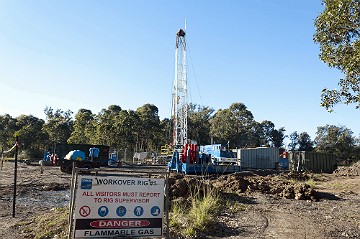 Led by Dr. Anna Karion, researchers found methane leakage rates were between 6 to 12% of production. Apparently there are technologies which can capture about 40% of the lost methane from the oil and gas, according to the Environmental Defense Fund (EDF) and the Natural Resources Defense Council. And these technologies are being used - but (for some reason) it's unclear how many sites are employing them. So sure, we have some "controls" in place, yet it appears that newer legislation doesn't apply to existing wells. Drew Nelson, EDF senior manager for natural gas projects, stated: "Existing wells are a big hole in the regulatory structure." Up next is an excellent video which explains why and how methane release becomes a vicious cycle in global warming. Arctic climate geoengineeringU.S. Geological Survey on flickr / Licensed under Creative Commons Attribution 2.0 Generic has been considered to halt this process by pumping or spraying water on top of polar ice caps. Stratospheric sulfate aerosols delivered by aircraft or balloon might create global dimming and limit the impact greenhouse gases have on global warming by their cooling effect. Increase fresh water and decrease salt water flow in the area with a dam connecting St. Lawrence Island and a threshold under the Bering Strait. The warmer, saltier waters from the Pacific Ocean would have less of an impact that way. Collect methane using kilometer-sized areas of plastic film and flare it off at sea or store it to use on shore. My sense is that we have to do all four (and whatever else we can throw at this urgent problem). United States Geological Survey / Public DomainThe deal with methane is that it's a catalyst - it remains in the atmosphere approximately 10 - 12 years. It has a half-life of 7 years. This means that if no methane was added to it, then every seven years, the amount of methane would be half (50% of what was originally there). So we need to buy ourselves some time to limit its massive warming effect on the earth. Carbon dioxide is a whole other beast. The current estimates are that 65 - 80% of it dissolves in the oceans over a period that can last 200 years. The remaining amount can take thousands of years via weather and rock formation. An article by Steve Connor in The Independent reminded me that 'an open ocean soaks up more heat from the sun than a reflective surface of an ice-covered one.' Pumping water on top of ice caps would surely reflect a good portion of the sun's heat. As for spraying aerosols, sulfate particles might provide a critical "grace period" of up to 20 years. Changing the flow of pacific water will impact ocean life; however, I'm certain that warm, salty water only hastens the warming we have in the arctic. 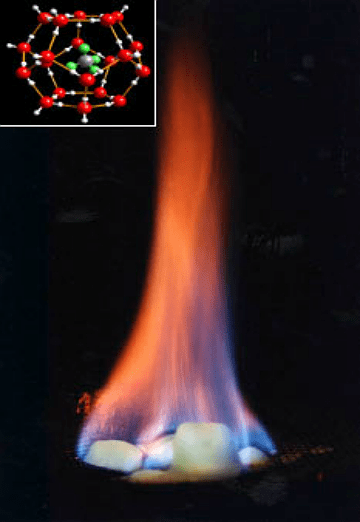 Lastly, the lesser of two evils might be to burn the methane (provided we can capture enough of it). I'm sure storing it might be a solution; however, the method used must be fail-safe to prevent leaking methane back into our atmosphere. As Howarth cautions, "Society needs to wean itself from the addiction to fossil fuels as quickly as possible. But to replace some fossil fuels – coal, oil – with another, like natural gas, will not suffice as an approach to take on global warming. Rather, we should embrace the technologies of the 21st century and convert our energy systems to ones that rely on wind, solar and water power."